Earlier, websites would use the IP address to determine your approximate location but with the HTML5 Geolocation API, web browsers can more accurately detect your location using data from GPS, Wi-Fi networks, cell towers, Bluetooth and the computer’s IP address. If you agree to share your location, the browser will send these details to Google Location Services for estimating your location which is then shared with the requesting website. Here’s how. Press F12 (or Ctrl + Shift + I) in Google Chrome to open the Developer Tools. Click the Settings icon in the lower right corner and switch to the Overrides tab (see the next screenshot). 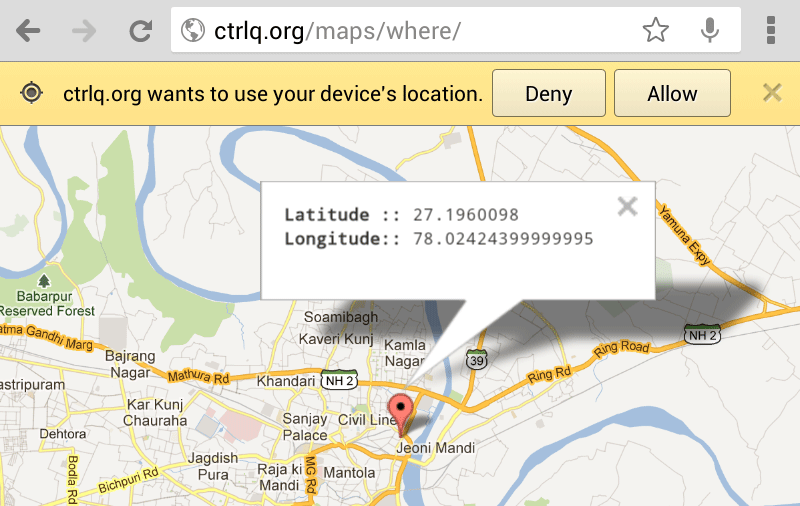 Now you can specify the exact latitude and longitude coordinates* that you want to share with that website. [*] You can use the Postal Address finder to know the latitude and location of a place. Make sure that the “Override Geolocation” setting is checked and then refresh the page to send that fake location. And this is obviously a useful feature for web developers who would like to test their geolocation-enabled apps from the same location.